Mark Russell Gelade celebrates the release of his new story collection, Navigating by Stars: 24 Very Short Stories of Love and Longing. 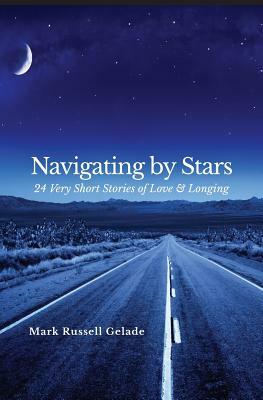 In Mark Russell Gelade’s debut book, Navigating by Stars: 24 Very Short Stories of Love and Longing we are given a brief glimpse into various stranger’s lives but somehow feel that we know them well. Written in first-person narratives that move between both male and female voices, Gelade’s stories center around issues that are timely and relevant: desire, divorce, nostalgia for the past, and consolation, with several of the stories interfacing with another story in the collection. In The Way Home, Vic stands at the sink washing dishes while contemplating the implications of leaving his wife. As he considers the impact this decision will have on his family; his lover, speaking for herself in a story titled Tomorrow—the World, expresses her own desire for connection, commitment, and wholeness. In If by Postcard, a female narrator describes the unexpected break-up of her latest relationship with a younger man. She expresses her disappointment at receiving a “break-up” postcard and wonders aloud about the merits of letter versus postcard writers. Attentive readers will recognize her ex-boyfriend, Eric, in the story, Night Vigil, where he confronts his inability to commit to a long-term relationship and reveals his own peculiar reasons for choosing to send a postcard, rather than a face-to-face to discuss the relationship. Navigating by Stars is the perfect book for readers who want to squeeze in a quick but satisfying read, whether that be on the ride to work, a lunch break, the doctor’s waiting room, or before going to bed. So compelling you’ll find it impossible to read just one!